1.5 Meter Light Up HDMI Cable, High Speed HDMI Cable. Supports Full HD 1080p, 4k and 3D. Clear/Silver cable with light up blue LEDs in connectors. VGA to HDMI Converter, Video and Audio. 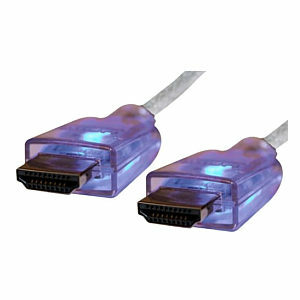 Adapter allows a PC, laptop or CCTV system etc with a VGA output to be connected to a TV HDMI input. Input connectors - VGA HD15 and 2x phono sockets for audio. HDMI output connector for connecting a standard HDMI cable. Supports VGA resolutions of up to 1280 x 1024 and HD TV resolutions of 1080p (1920 x 1080). Power supply included. 4x4 HDMI Matrix Switch, supports 1080p and Deep Colour. Connect 4 HDMI devices and switch to 4 TVs displays or projectors independently. Infra red remote control for switching between devices and displays. Inputs can be switched via IR remote or serial (RS232) Distributes any of the four inputs to any combination of the four HDMI output displays Supports HDTV resolutions up to 1080p. Supports 12 bits per channel deep colour (36 bit). Supports HDCP Support uncompressed audio such as LPCM. Support compressed audio such as DTS Digital, Dolby Digital including DTS-HD and Dolby True HD. HDCP compliant. 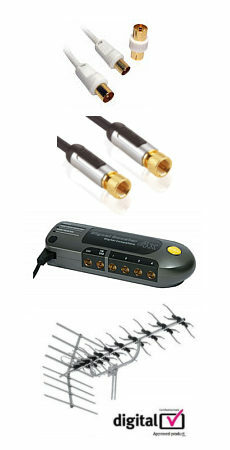 Power supply included 5V DC 4A Remote Control and IR sensor included.